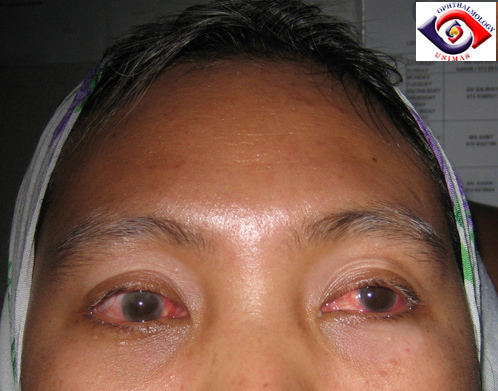 A 40 year-old Malay woman who came from a remote village presented to our eye department in mid-September, 2005 with bilateral acute iridocylitis. She was previously well. Her vision was 6/12 in both eyes and slit-lamp examination revealed cells in the anterior chamber and the anterior vitreous. She was started on topical steroid which failed to control the inflammation. Investigation including chest X-ray and blood tests (full blood counts, VDRL and auto-immune screening) were normal. She was started on oral prednisolone of 60 mg po od. During the treatment, she complained of problem with her hearing in both ears. An ENT referral was made. Unfortunately, the patient failed to return for further follow-up from mid-Oct, 2005. She reappeared in the clinic recently with bilateral severe visual loss and persistent ocular irritation. She also had bilateral profound sensory deafness and recent dermatological changes (Figure 1 and 2). During her period of absence from the clinic, she had been seeing a local traditional doctor for treatment but without effect. Her visual acuity was light perception. Slit-lamp examination revealed bilateral seclusion pupillae (Figure 3) without any views of the posterior segments. The intraocular pressures measured 4 mmHg on applanation tonometry. B-scan ultrasound showed the retina appeared flat. She was started on topical steroid, topical atropine and high dose prednisolone 100mg po od. The inflammation responded well to treatment but the pupil remained occluded despite intensive mydriatic treatment. Her vision improved to hand movement one week later. Figure 1. Bilateral red eyes with poliosis, white eyebrows and whitelocks. Figure 2. 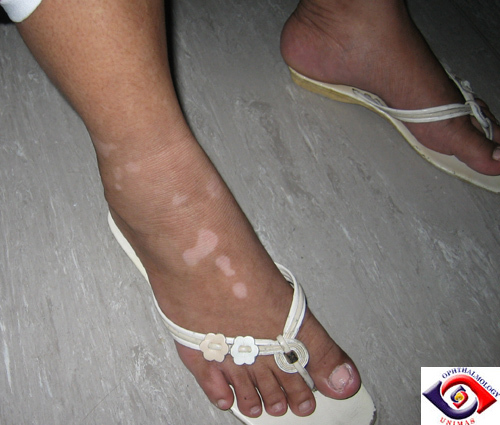 Vitiligo of the right leg. Figure 3. Complete occlusion of the right and left pupils. The plan is for her to undergo pupil stretch +/- iridectomy once the inflammation is controlled. b. What is the main differential diagnosis? c. What is the temporal relationship between the eye presentation and the systemic manifestations in this condition?